mr moonhead – Page 2 – Conversation With A Zombie. 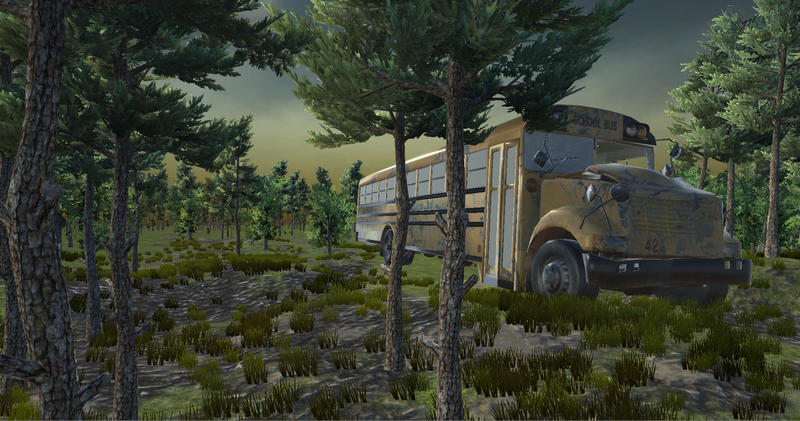 The game takes place inside a broken down school bus in the middle of the woods. You are sat in the school bus, rotation is free to assume any orientation but the player cannot move. A stranger (NPC) boards the bus. They are armed with a pistol at the ready. The stranger shows visible caution towards the protagonist (unspoken, through body language) but after checking behind the protagonist sits in a seat opposite them. After a period of deliberation, the stranger explains their set of circumstances to the player. They have been bitten by the un-dead and infected. Aware of the circumstances, the stranger hands you their gun and instructs the protagonist that when the time is right to “do the right thing”. The infection takes ten minutes to kill the stranger. However, there is a random variable on how far the infection has progressed, your conversation could be as little as three. The complexion of the stranger is a subtle hint regarding how much time you have. Likewise, there is a random variable on how many bullets there are in the gun (maximum of four) and what time of day it is (the latter will effect small talk). The game is a linear conversation between you and the stranger. The protagonist communicates through multiple-choice response (maximum five). So the conversation can change depending on player choice. These choices are time-sensitive and cycle through theme and meaning. Conversation will fluctuate between dialogue trees and small talk. Small talk: external factors outside the bus (the wind, a strange noise or a zombie shuffling far-off in the woods) but will never interrupt the flow of a dialogue tree. Dialogue trees: longer conversations that will flow and explore a particular theme or issue. Key moments in the dialogue tree will be stored as variables to be brought up later. For instance, the history of the protagonist can be created through conversation and the stranger may reference nuances in the protagonist’s history in a later conversation. The player has the option to raise the gun and shoot (or try to shoot) the stranger at any point. If the player points the gun at the stranger without shooting it evokes a negative response. Point the gun too many times and the stranger leaves the bus. Shooting the stranger ends in the following End States. Pre-emptively shooting the stranger with a lethal shot (chest area or head). The stranger dies and the player remains in the bus. Shooting the stranger at the right moment (as they turn). The protagonist gets up and leaves the bus. The stranger turns and the player does not shoot them initiates struggle animation. The stranger is a zombie. The player pre-emptively shoots the player with a non-lethal shot or close to the stranger initiates struggle animation. The stranger is still human. The stranger jumps the protagonist and they both fall to the floor. Either as a zombie or alive, the stranger is on top of the protagonist, there hand is on the protagonist’s wrist with the gun in it. The gun is positioned away from the stranger off-screen. The gun sweeps across the screen giving the player a one second success window (if shot will kill the stranger). The gun is pointing off screen (two second fail window) the other direction from how it was initially. If shot will miss the stranger. If the player runs out of bullets or doesn’t shoot the stranger. If the stranger is alive, the stranger will wrestle the gun out of your hands and leave the bus. If dead, the stranger/zombie will eat you.